We moved into a 177 years old house in June. To put it politely, the house has been "very gently restored" over that period. The good thing about this is our floor boards are the original old wooden planks. One entertaining Winter past time is pulling things out of the wide gaps. Our most interesting recent discovery is this 1924 wheat penny! 1924 Wheat Penny found in 2013. Wow! 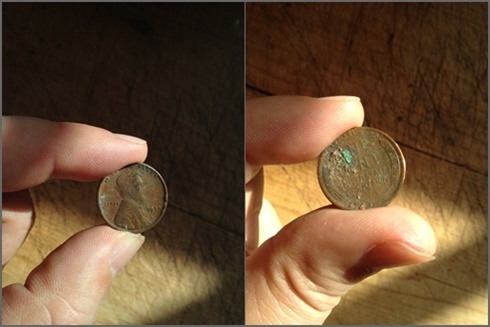 A few days after finding it, I saw my boyfriend Googling how to clean a copper coin. My knee jerk reaction was to scoff at him. What a waste of time, I thought. Then the Angel of Procrastination offered me another perspective. I looked down at the pile of pots I was washing and suddenly it seemed so important that I help him immediately. I am a cleaning blogger after all, my ego nudged. Within seconds I was totally crashing his coin cleaning party. Here's how we cleaned the copper penny together. We cleaned our old copper penny. Laugh all the way to the bank. A copper wheat penny is worth $.75 to $450 or more today, depending on the year. Today's pennies are made of 97.5% zinc and only 2.5% copper, according to Wise Geek. You can apply this technique of using salt and an acid (vinegar, lemon juice, or a sliced lemon for example) to clean anything made of copper metal. 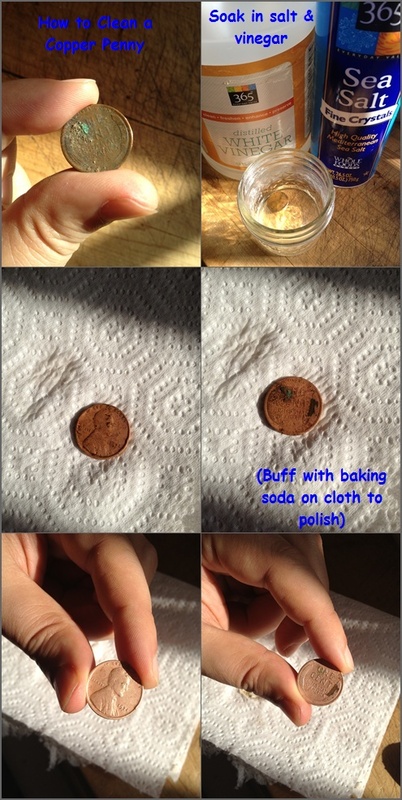 You can use baking soda on a cloth to buff any metal too. Wow that penny is a soldier if it has been in the house since 1924! The stories it could tell if it you know had a mouth. :) That's pretty cool.